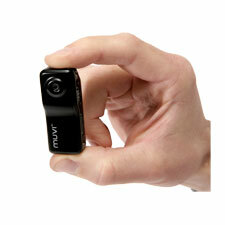 MUVI™ Pro Micro DV Camcorder » Protective Solutions, Inc. The MUVI™ Pro Micro DV Camcorder's unique micro design enables digital video recording in situations where it may not be possible to use standard camcorders. It also features a voice activated start/stop recording function so it can be used completely hands free. Mounting accessories available separately include Universal Suction Mount (dashboard), Extension Arm Pole Mount and Tripod Mount. Spring mounting clip included.